Baja California Sur, or ‘Southern Lower California’ is a small state in north western Mexico, hosting an array of remarkable wildlife and varied scenery. Although it’s the second smallest, it’s actually the longest state with over 2000km of stunning coastline. The mountainous landscape rises up above the large coastal plains, with some areas not seeing rain for decades. With the Pacific Ocean to the west and the Gulf of California to the east, fresh seafood is prominent. A local favourite is breaded and fried clams accompanied with fresh tortillas. You will also find manta ray on the menu, a local delicacy. Make sure you try some of the many local fruits, the most popular being green papaya, dates, guavas and pitahayas. The largest town and capital, La Paz is a quirky and cosmopolitan seaside town with many shops, restaurants and bars. Be sure to organise a day trip to Espiritu Santo, which is an UNESCO world heritage site. Its collection of 244 tiny islands and beautiful cliffs in shallow waters make it ideal for a kayaking tour. Perhaps the most magnificent feature, Land’s End, is found in Cabo san Lucas on the state’s southernmost tip. Just a short boat trip away, this is a picturesque landmark comprising natural arches and jagged rocks, accompanied by sea lions and pelicans. 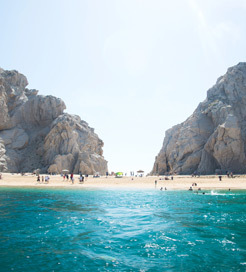 Cabo san Lucas is also home to a number of great beaches. Playa Medano is ideal for sunbathing and jet-skiing, whilst Playa Solmar is very pretty but has dangerous rip tides. La Paz offers the only port. There are routes taking you across the Gulf of California to Topolobampo and Mazatlán with 7 and 3 journeys per week respectively. The latter is further south with an average sail time of around 18 hours, whereas Topolobampo is just 7 hours away. Baja Ferries offer 2 vessels for the journeys. The California Star holds 100 cars and 900 passengers whilst the La Paz Star carries 200. Both ferries are comfortable and air-conditioned with restaurants, bars and cafeterias. For more information, please visit our Ferries from Mexico to Baja California Sur page.